Based in New York, the United Nations (UN) is an international organization that works to improve relations between countries. In 1945, 51 countries came together after World War II to form the UN. These countries included China, the United Kingdom, the United States, and the USSR, now known as Russia. The UN has since come to include 193 of the 200 independent states in the world. Governments who are a part of the UN, send representatives to discuss and attempt to solve global problems. Each UN member country has one general vote in the UN’s General Assembly. The UN aims to promote health, education, trade, and cultural understanding through two sections of the Economic and Social Justice Council (ESC). 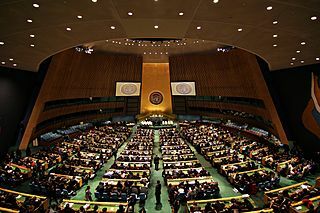 Meeting every fall for three months, the first of these bodies—the General Assembly approves UN work, debates important issues, and decides how to spend money. This council can also hold a special session during an emergency. The other branch of the UN, the Security Council, is made up of 15 member countries who can send peace-keeping forces to any country and condemn threatening actions of countries around the globe. While the UN has very noble goals and ideas, it does not always achieve its goals. In the 1990s, for example, the UN tried to stop civil wars in Rwanda and Bosnia, but failed. Additionally, in 2003, the Security Council argued against military action in Iraq. A group of nations led by the U.S. went to war with Iraq anyway. Even though the UN has problems, it still helps many people by sending forces to restore peace around the world and by sending aid to those in need.